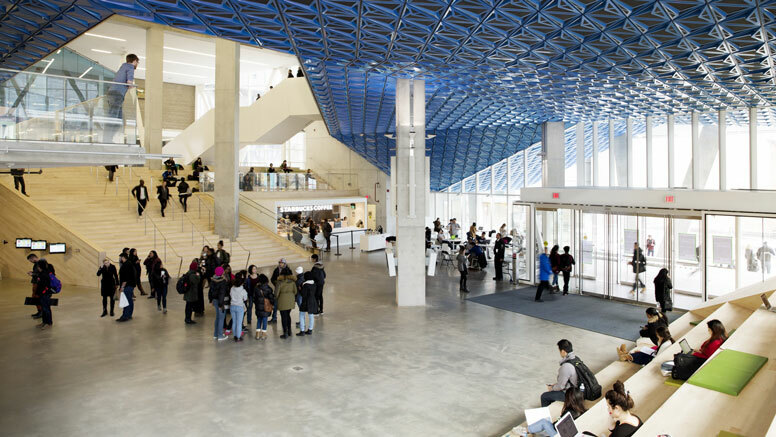 Snøhetta has published a 34 page illustrated profile of the book-free Student Learning Centre at Ryerson University, Toronto. The Student Learning Centre (SLC), designed by Snøhetta and Zeidler Partnership Architects, opened in 2015. It won the Canadian Architecture Award for Design Excellence. Inspired by the historical gathering spaces of the Stoas and Agoras in ancient Greece where learning was inherently social, the lively SLC gives students eight uniquely-designed floors of generous space to meet, study, and exchange ideas. Conceived as a library without books, the design develops natural conditions for groups of people to interact while also offering areas for controlled and introspective study. Most importantly, it encourages students to make the space their own. 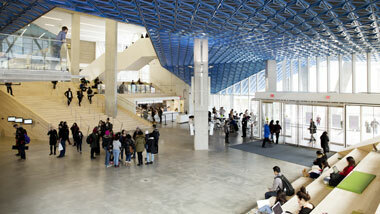 The SLC is a library built for the digital age that encourages students to interact with their physical environment. Since its opening, the new campus landmark has become a popular hub filled with student activity from 7 AM to 1 AM each day. Download the full illustrated document.